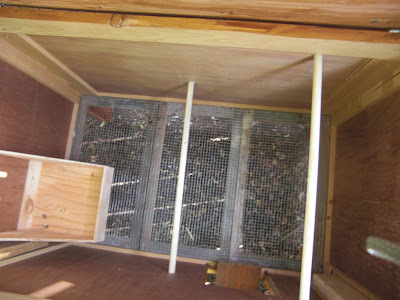 For 6 weeks I struggled at designing the perfect little coop for our chicks. I scoured the classifieds, local farm stores, and online designs. The trick was finding something which looked decent, blended in with our yard, and fit our budget. 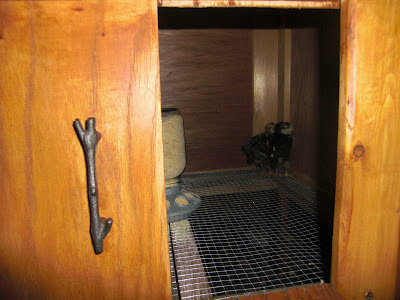 People are really selling coops that are nicer than my house, and they cost over a thousand dollars. Not for us. Finally, last week we had a fortuitous find. A local carpenter was selling a partly finished coop for $50. Now that was my style! Brent picked it up and within a couple days our charming chicks have some fancy new digs. 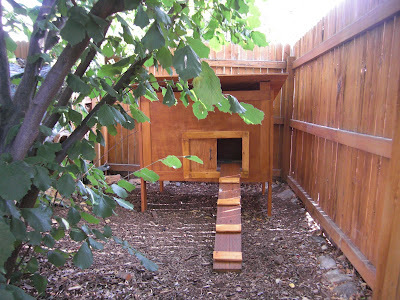 We added the door, nesting box, roosts, roof, ladder, and then stained the entire coop. The final results are great. When the hens start laying we will add an additional door that accesses the nesting box, so the kids can help collect the eggs. It is actually a bit larger than I planned and could fit up to 12 hens I think. But it still sits below th,e fence line, which was important to us. I went out to snap a photo tonight of the little gals in their new coop and this is what I found. Heartless, cruel chick owner comes to mind. The poor little things all huddled together in the corner. Maybe they aren't quite as grown up as I thought. 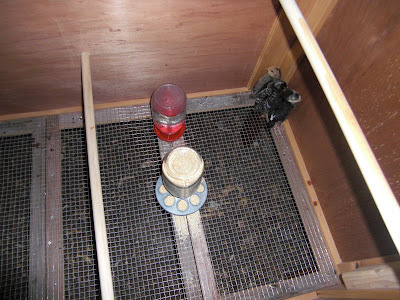 Brent and I went to the garage and brought the brooder out to the coop. We set it next to the coop and put the little chicks inside with a blanket over top. Hopefully they will sleep more peacefully now. Today I caught them enjoying a dust bath together by the fence. How is it having backyard chickens you wonder? So far so good. I would estimate over half our backyard is quite "wild and wooded." The chicks have a hay day scratching around at rotten fruit under the apple and peach trees or foraging for bugs and other miscellaneous treats. They tend to stay in the woodchips as does their little chicken poop. If ever I catch them in my strawberries or garden they get a quick spray with hose or chase from the kids. 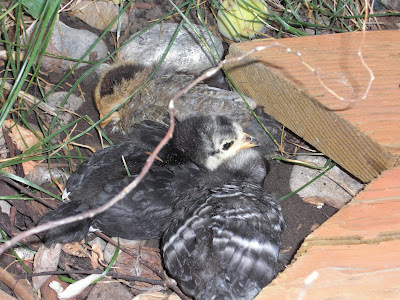 The chicks spend the entire day outside. From 7 am until 7 pm. I noticed today they went into their coop a couple times for water and some easy grub. So far we haven't felt a need to build a run. They are not a nuisance at all. I may change my tune later. We'll see.